I went to Africa to photograph and write about cheetahs. 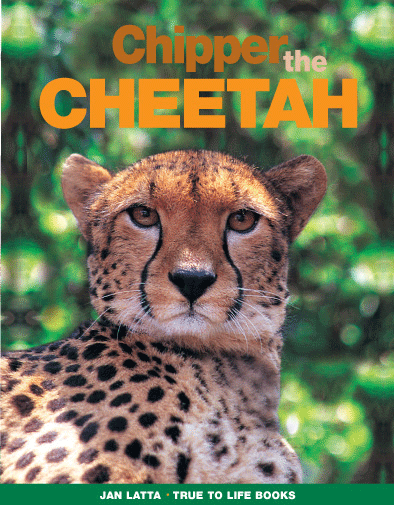 It was a close encounter with two cheetahs in Nanyuki, near Mount Kenya, that helped to create Chipper the Cheetah book. I was amazed when a cheetah walked towards me, then flopped down in the grass nearby. On the next trip I returned to the same area and the cheetah came up to me again. I put my hand on the cheetah’s throat to feel the vibration of its purring on my hand. It was the most magic moment of my life. I’ve returned to Africa ten times. I live in a small tent with no modern amenities. Each day is wonderful experiencing adventures with my African guide. It has been exciting watching cheetahs strutting through the golden grass, mothers protecting their cubs from danger and the drama of the hunt. The concept for the book is the cheetah talking to children about its life in the wild and how it can survive. There are maps, interesting facts and fun activities. See this video of cheetahs in the wild.